SNOODS FROM JAZPIZAZ INCLUDE A BARETTE CLIP WITH A LACE BUN COVER HOLDER THAT ALLOWS YOU TO KEEP HAIR UP AND NEAT WHILE DISPLAYING YOUR HAIR BUN IN A FASHIONABLE WAY. Introducing our Jaz HairJewels collection of beautiful Satin with Velvet Hair Bun Cover Snoods. Accented with Rhinestones and a Satin Ribbon Hair Snood these elegant hairpieces are available in Stripe Satin Bows or Solid Satin Ruched Bows. CHILDREN'S MINI SNOODS - SPECIAL OFFER! • Children's Pastel Aqua Blue Mini Snood Hair Bow (SKU: HCSAQUA001) Pastel aqua mini hair bow snood for children. 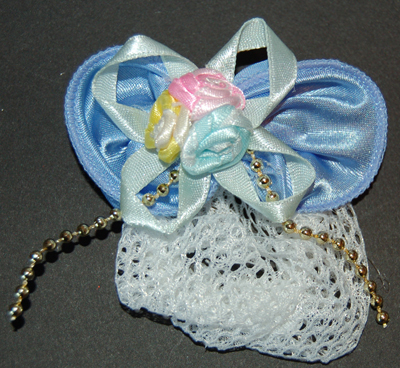 Snood has an Aqua Bow accented with multi color flowers and a satin ribbon. Includes a french clip with a Hair Bun Cover Net. Special priced so you can combine colors and quantities. Perfect for any little girls hair. • Children's Pastel Purple Mini Snood Hair Bow (SKU: HCSMINIPPL001) Patel purple mini hair bow snood for children. 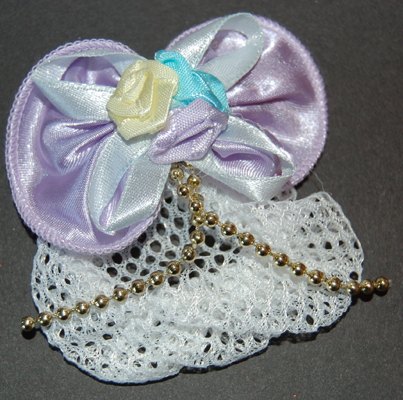 Snood has a Purple Bow accent with ribbon and multi color flowers on the bow. Includes a french clip with a Hair Bun Cover Net. Special priced so you can combine colors and quantities. 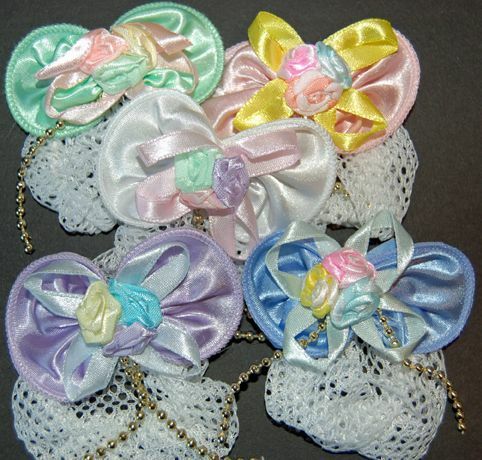 Perfect for your little girls cute hair styles. • Children's Pastel Yellow Mini Snood Hair Bow with French Clip (SKU: HCSMINIYEL001) Pastel yellow mini hair bow snood for children. 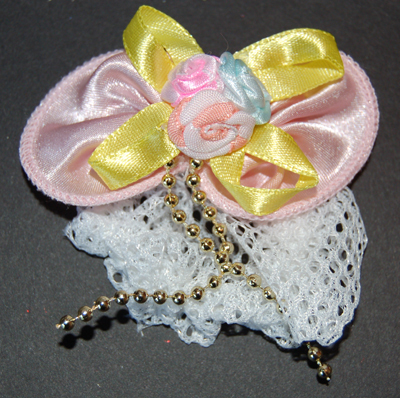 Snood has a yellow bow accent with multi-colored flowers and a ribbon accent on the bow. Includes a French Clip with a Hair Bun Cover Net. Special priced so you can combine colors quantities while they last. Perfect for your little girls hair styles. • Children's Royal Blue Mini Snood Hair Bow with French Clip (SKU: HCSMINIRBLUE001) A Royal Blue mini hair bow snood for children. Snood has a Blue Bow accented with a blue satinribbon and multi color flowers on the bow. Includes a french clip with a Hair Bun Cover Net. Special priced so you can combine colors and quantities. Perfect for your little girls hair style. • Children's White Mini Snood Hair Bow (SKU: HCSMINIW001) A white mini hair bow snood for children. 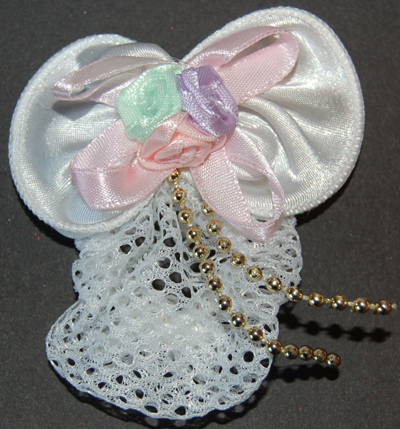 Snood has a White Bow accented with a white ribbon and multi color flowers on the bow. Includes a french clip with a Hair Bun Cover Net. Special priced so you can combine colors and quantities. Perfect for your little girls hair style. • Childrens Pastel Pink Mini Snood Hair Bow with French Clip (SKU: HCSMINIP001) Pastel pink mini hair bow snood for children. 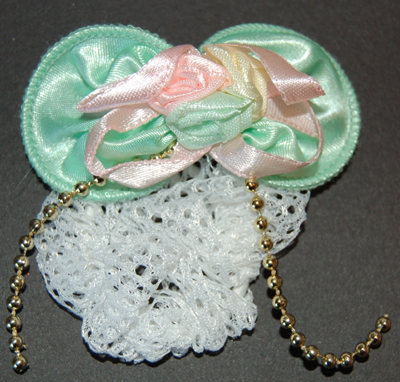 Snood has a Pink Bow accent with ribbon and multi color flowers on the bow. Includes a french clip with a Hair Bun Cover Net. Special priced so you can combine colors and quantities. Perfect for your little girl who loves to look pretty. WOW! Children's mini snoods in five beautiful Pastel Colors! All accented with a Gold Bead Ribbon this collection of Hair Snoods will make every little girl feel special. Perfect for little dancers and ballerinas. YOU WILL RECEIVE (5) FIVE HAIR SNOODS WITH EVERY ORDER AT THIS INCREDIBLE PRICE. Children's White with Pastel colors Mini Snood with Gold Bead accents. Includes a white Hair Bun Net and French Clip for secure placement in hair. PASTEL LAVENDER CHILDREN'S MINI HAIR SNOOD with GOLD BEAD ACCENTS HAS A WHITE HAIR BUN NET WITH A FRENCH CLIP TO HOLD HAIR IN PLACE SECURELY.